In 2015, eight new municipalities became Sustainable Maryland Certified, and four municipalities became re-certified, for a total of 30 certified municipalities. In total, 63 municipalities were registered with the Sustainable Maryland program. 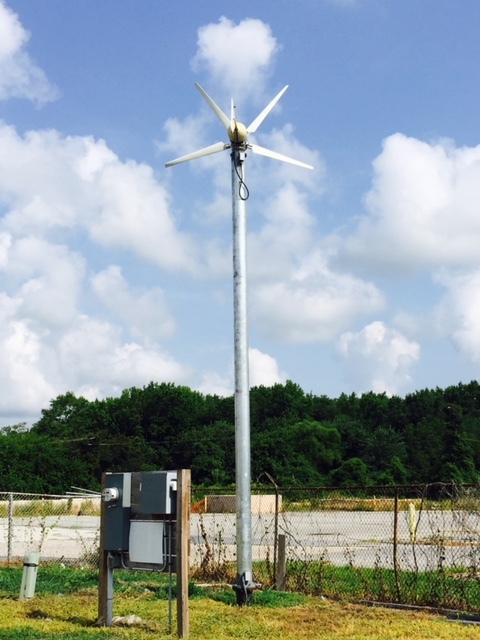 Installed a 7 kilowatt wind turbine on town property, generating clean renewable energy. Provides Free Wi-Fi connectivity to residents and visitors in the historic downtown. Established a stormwater utility fee to fund stormwater infrastructure improvements. Enacted a Residential Poultry Raising Policy to help foster local food production. Hosts an annual Peach Festival that highlights local food and heritage of the region. Provides a Workplace Wellness program for employees, offering Yoga, Blood Pressure Screening, Flu Vaccines, Drug Screening and Exercise programs. Home to a certified Maryland Green School. Hosts 2nd Friday Art Strolls as part of a Buy Local campaign to bolster the local economy. Developed the Walkable-Bikeable Berlin/Assateague Gateway Corridor Trail project in partnership with the Lower Shore Land Trust, an initiative to plan and develop a network of walking and biking trails within the town and connecting the town with nearby amenities. Installed a solar array on top of City Hall, which produces about approximately 14,000 kilowatt hours/year and reduces energy costs approximately $8,000 annually. The City also receives solar renewable energy credits approximately $1,500/year. Formed a Corn Bin Cooperative to help supply residents with bio-fuel for home heating. Operates a community garden program with 32 plots. Created more than 300 bicycle parking spaces through installation of bike racks in the city’s downtown historic core. Created a Bicycle Master Plan. Created a Green Infrastructure Master Plan. Created a Carbon Footprint Report that illustrates the city’s energy usage across buildings, vehicles and operations. Adopted a municipal tree ordinance in order to better protect, preserve, and promote the city’s urban forest. Developed a waste reduction and recycling guide with handy information for residents on recycling and local businesses and programs that help support waste reduction and reuse. Backyard Composting Program: the City is diverting 54,036 lbs or 27 tons of food waste that otherwise would be disposed of in a landfill. The City is saving as estimated $1,594 per year by not disposing of waste in a landfill. The program plans to reach a goal of 225 households. Installed a 1.32 megawatt solar photovoltaic field on 5 acres at the Chestertown Waste Water Treatment Plant that will power all of the Town’s municipal energy needs, including Town Hall, Visitor’s Center, Police Station, Town Yard, and Waste Water Treatment Plant. Created a Public Arts Master Plan. Hosted a Farmers Market since 1981, which was twice voted “#1 Small Farmers Market in Maryland” by the American Farmland Trust. Remained a certified Tree City USA for nearly 34 years, making it the second longest participating municipality in Maryland. Completed Phase III of the Gilchrest Rail Trail, a network of nearly two miles of converted railroad tracks that connect the waterfront, downtown, Washington College, Gateway Park and the commercial area at the north end of Town. Facilitated the creation of a Solar Cooperative, whereby homeowners join together to solicit bids from solar installers. The combined purchasing power of the co-op translates to significant savings on the cost of residential solar projects. Completed a Step Pool Conveyance stormwater project adjacent to 54 acres of impervious surface on commercial property, helping to oxygenate stormwater runoff and reduce nitrogen runoff by 400 lbs./year and phosphorus runoff by 50 lbs/year before it reaches the nearby Chester River. Earned recognition as a bronze-level Bicycle Friendly Community from the League of American Bicyclists. The city boasts more than 34 miles of dedicated bicycle infrastructure; participates in Capital Bikeshare; offers bike rack grants to local businesses; conducts bike safety checks; organizes bike tours, and actively celebrates Bike Month in May each year. Home to six certified Maryland Green Schools. A part of the Buy Local Campaign, the Rockville Rewards Card offers significant discounts at 100+ local businesses. All proceeds from the card sales go to the non-profits partnered with the businesses. In over 4 years, the program has collectively earned more than $100,000 to support the local non-profits. Hosted a Farmers Market for over 25 years. Maintained a Tree City USA designation for 26 years, featuring approximately 28,000 street trees and more than 300 acres of parkland designated as Urban Forest. The Woottons Mill Park Community Garden, started more than 40 years ago, maintains close to 180 plots that typically play host to approximately 120 gardeners each year. Engaged residents in watershed stewardship with Adopt-A-Stream, Save Our Streams, and Invasive Plant Management programs. The Adopt-A-Stream program recruited approximately 185 volunteers who collected 189 bags of trash. Established an Employee Health & Wellness program that offers health fairs, screenings, counseling, healthy lifestyle programs, exercise programs, and incentives to increase health awareness, provide education, and foster behavior change. Approximately 60% of employees participate in at least one wellness activity or event per year. Adopted a Green Purchasing Policy for procurement of municipal goods and services. Presented “Sustainable Saturdays” series of workshops, classes and information sessions promoting sustainability, waste reduction, and energy savings for local residents. Created an impressive Sustainability Resource Center at City Hall, with information for residents on topics like residential energy, recycling, stormwater management, composting and pet waste. Hosts a weekly Farmers Market. Maintains a Community Garden for city residents. Hosts annual “Boneyard Days”, allowing citizens to drop off used, but usable, items to be given away rather than taken to the local landfill. Partnered with Goodwill Industries on a Curbside Pickup Program, which has so far diverted more than 26,000 pounds of clothing, small appliances, electronics, books, computers, furniture and more from the waste stream. Retrofitted City Hall parking lot for improved stormwater management. Constructed the Eastern Shore’s first complete “Green Street”, with porous concrete sidewalks, pervious paver parking areas, rain gardens, mid-block and intersection bumpouts to slow traffic, and dedicated bike lanes. Hosts a local Farmers Market on City-owned property, with more than 20 vendors. Installed LED streetlights throughout town, and installing LED lighting in Public Works office, City Hall, Council Chambers, Police Substation and the Marina Office. In conjunction with the Shore Power Project, compiled a Municipal Carbon Footprint, an inventory of the town’s energy usage. Promotes the Second Saturday and Art Walk, a Buy Local campaign with shops and galleries staying open late with specials, free food, and more. Home to three certified Maryland Green Schools: Centreville Middle School, Gunston Day School, and Kennard Elementary School. Earned the National Wildlife Federation’s “Certified Community Wildlife Habitat” designation, reflecting both wildlife-friendly residential backyards and municipal policies. Created the Centreville Heritage Development Plan, a framework to promote economic revitalization through heritage tourism, with the goal of transforming the town into a vibrant destination for heritage tourism on the Eastern Shore. Hosts a local Farmers Market, which has been a feature of the community since 1794. Installed 4,172 solar panels that are projected to save the residents of Centreville more than $1 million in electricity costs over the 20 year. Created a Green Business certification program to encourage local business to go green. Completed an Urban Tree Canopy Assessment and Planting Plan, which preserve the urban forest and improve the management of public trees. This vision will help ensure canopy continuity, reduce stormwater runoff and improve air quality, public health, and aesthetic values. Installed Ultra-Urban Filters inside of 52 stormwater drains within the town. These innovative filters are designed to catch and remove debris, hydrocarbons, phosphorus, and sediment from stormwater entering local waterways. Replaced all traffic lights in the municipality with energy-efficient LED lights, saving over 50% energy usage. Home to a certified Maryland Green School – Easton High School. Hosts a Farmers Market with more than 30 vendors. Completed energy audits of Town Hall and Fire Station. Completed a business plan for the Chesapeake Harvest Food Distribution Network, a “food hub” expected to facilitate healthy food production and distribution in the region. Completed the replacement of all 330 town-owned streetlights with LED energy-efficient bulbs, cutting streetlight energy use by nearly 70% and the Town’s overall energy use by 10%. Installed approximately 2 megawatts of solar panels to provide 95-100% renewable energy to run a new, state of the art wastewater treatment plant. Home to a certified Maryland Green School -- Mother Seton School. Maintains a small Community Garden for residents. Created a network of 15 miles of multi-user natural surface trails, utilizing over 1,000 hours of volunteer work and approximately $300,000 in private donations. Received bronze-level “Bicycle Friendly Community” designation from League of American Bicyclists, which recognized the City's Bicycle Master Plan and Bicycle Advisory Committee. Features a robust Buy Local campaign, including Center City Dollars, pop-up shops, and various festivals. Partners with Recyclebank to provide an innovative recycling incentive program. Developed a Water Conservation Plan. Adopted a “Livable Streets” policy to foster a pedestrian, bicycle and transit-friendly environment wherever possible. Remained a Tree City USA community for 30 years. Adopted a Green Construction Code, requiring new construction of a commercial/industrial buildings of more then 15,000 square feet to meet LEED Silver or similar requirements. Home to several Maryland Green Schools – Bond Mill Elementary, Deerfield Run Elementary, Laurel Elementary, Hammond Elementary, Forest Ridge Elementary. Hosts a Farmers Market on Main Street. Operates a Community Garden with 56 plots. Offers municipal employees a Health & Wellness Program which allows employees to accumulate points for healthful activities, with which they can earn paid time off. Employees also have free access to two fitness centers and two outdoor pools; receive a discount on all Parks and Recreation programs, and have access to an on-site Wellness Library and regular “Lunch & Learn” programs. Remained a Tree City USA community for 22 years. Created a Bicycle Master Plan and Map. Taken the lead in developing and implementing the Patuxent River Policy Plan. Installed a 1.1 megawatt solar photovoltaic system at the wastewater treatment plant, which provides clean, renewable energy and a savings of approximately $30,000/year in energy bills. Installed LED streetlights in two of the Town’s most prominent parks. Created a Sustainability Resource Center at Town Hall, with a virtual version on the municipal website. Maintains a Community Garden in partnership with local non-profit Poolesville Green. Developed an inventory of residential septic systems within the Town limits. Retrofitted Town Hall parking lot with pervious pavement, providing improved stormwater management. Home to three certified Maryland Green Schools -- Poolesville Elementary School, John Poole Middle School, Poolesville High School. Sustainable Maryland hosted three Leadership Training Workshops in November 2015 on the topic of Creative Financing for Sustainability Projects. Workshops were held in Cambridge, College Park and Hagerstown. Sustainable Maryland hosted our first Frederick County Green Team Summit in March 2015. Representatives from ten municipal Green Teams attended. Sustainable Maryland staff conducted five Wednesday Webinars on a variety of topics, including marketing, sustainable purchasing, DHCD Sustainable Communities, HEAL Cities, and community gardens. Sustainable Maryland staff conducted customized training sessions with more than a dozen Green Teams across the state, providing a information on completing Action Plans and specific strategies for achieving local sustainability goals.